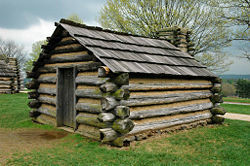 Replica of a cabin in which Continental Army soldiers lived at Valley Forge. 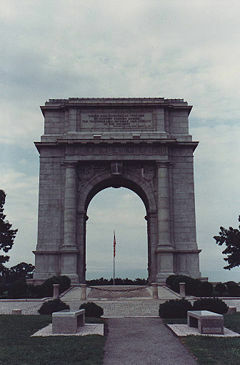 Valley Forge, Pennsylvania, was the site of the American Continental Army camp over the winter of 1777–1778 in the American Revolutionary War. This was a time of great suffering for George Washington's army, but it was also a time of retraining and rejuvenation. The army barely survived the dire conditions; they were demoralized, hungry, and, because of the extreme weather, in many cases very ill. In January 1777, Washington expressed grave concern that the army would disintegrate and conceded: "If the army does not get help soon, in all likelihood it will disband." The weather began to ease in February and Washington appointed General Nathanael Greene head of the meager and poorly managed Commissary Department in March. Under Greene's direction, food and supplies that had been diverted under his predecessor began to arrive. Prussian general Friedrich von Steuben, a career soldier and veteran of the Seven Years' War, arrived from Europe and began to drill Washington's threadbare troops. By April 1778 he transformed them into a fighting force. Also in April, the Conway Cabal, a plot to remove George Washington from power, was exposed and permanently disbanded. With spring, news arrived at Valley Forge of an alliance with France, providing military and financial support. On June 19, 1778, exactly six months after they retreated to Valley Forge, a new army eager to fight the British marched out toward New Jersey. They had come through the sacrifice of deprivation and desolation and been transformed into a mature fighting force. On December 19, 1777, when Washington's poorly fed, ill-equipped army, weary from long marches, struggled into Valley Forge, winds blew as the twelve thousand Continentals prepared for winter's fury. Grounds for brigade encampments were selected, and defense lines were planned and begun. Within days of the army's arrival, the Schuylkill River was covered with ice. Snow was six inches deep. Though construction of more than one thousand huts provided shelter, it did little to offset the critical shortages that continually plagued the army. Soldiers received irregular supplies of meat and bread, some getting their only nourishment from "firecake," a tasteless mixture of flour and water. So severe were conditions at times that Washington despaired "that unless some great and capital change suddenly takes place ... this Army must inevitably ... Starve, dissolve, or disperse, in order to obtain subsistence in the best manner they can." Animals fared no better. General Henry Knox, Washington's Chief of Artillery, wrote that hundreds of horses either starved to death or died of exhaustion. Clothing, too, was wholly inadequate. Long marches had destroyed shoes. Blankets were scarce. Tattered garments were seldom replaced. At one point these shortages caused nearly four thousand men to be listed as unfit for duty. Undernourished and poorly clothed, living in crowded, damp quarters, the army was ravaged by sickness and disease. Typhus, typhoid, dysentery, and pneumonia were among the killers that felled as many as two thousand men that winter. Although Washington repeatedly petitioned for relief, Congress was unable to provide it, and the soldiers continued to suffer. Women, usually relatives of enlisted men, alleviated some of the suffering by providing valuable services such as laundry and nursing that the army desperately needed. Upgrading military efficiency, morale, and discipline were as vital to the army's well-being as was its source of supply. The army had been handicapped in battle because unit training was administered from a variety of field manuals, making coordinated battle movements awkward and difficult. The soldiers were trained, but not uniformly. The task of developing and carrying out an effective training program fell to Friedrich von Steuben. This skilled Prussian drill master, recently arrived from Europe, tirelessly drilled and scolded the regiments into an effective fighting force. Intensive daily training, coupled with von Steuben's forceful manner, instilled in the men renewed confidence in themselves and their ability to succeed. Soon word of the British departure from Philadelphia brought a frenzied activity to the ranks of the Continental Army. On June 19, 1778, six months after its arrival, the army marched away from Valley Forge in pursuit of the British who were moving toward New York. An ordeal had ended. The war would last for another five years, but for Washington, his men, and the nation to which they sought to give birth, a decisive victory had been won—a victory not of weapons, but of will. Friedrich Wilhelm von Steuben was a onetime member of the elite General Staff of Frederick the Great, King of Prussia. A career soldier from a lineage of military men, von Steuben was a veteran of the Seven Years' War. No longer in the Prussian Army, indeed without employment of any kind, von Steuben offered his military skills to the patriot cause. When he arrived at Valley Forge from France on February 23, 1778, he was armed with a letter of introduction from Benjamin Franklin. George Washington saw great promise in the Prussian and almost immediately assigned him the duties of Acting Inspector General with the task of developing and carrying out an effective training program. Von Steuben shocked many American officers by breaking tradition to work directly with the men. One officer wrote of von Steuben's "peculiar grace" as he took "under his direction a squad of men in the capacity of drill sergeant." From dawn to dusk his familiar voice was heard in camp above the sounds of marching men and shouted commands. Soon companies, regiments, and then brigades moved smartly from line to column and column to line, loaded muskets with precision, and drove imaginary redcoats from the field by skillful charges with the bayonet. When the Continental Army paraded on May 6, 1778, to celebrate the French alliance with America, von Steuben received the honor of organizing the day's activities. On that day the Grand Parade became a showplace for the united American army. Cannons boomed in salute. Thousands of muskets fired the ceremonial "feu de joie," a running fire that passed up and down the double ranks of infantrymen. Cheers echoed across the fields. The good drilling order and imposing appearance that the troops presented during the Alliance Day ceremonies demonstrated their remarkable progress in improving their abilities as a unified, fighting force capable of defeating the British Army. Washington, with von Steuben's aid, had made an army of the Continental troops. With their French allies, the Americans could now proceed with the war. 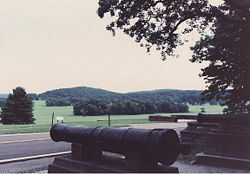 The site of the encampment became a Pennsylvania State Park in 1893 and, on the 4th of July, 1976, it became Valley Forge National Historical Park. The modern park features historical and re-created buildings and structures, memorials, and a newly renovated visitor center, which shows a short film and has several exhibits. ↑ ushistory.org, What happened at Valley Forge. Retrieved October 23, 2007. ↑ National Park Service, Valley Forge Retrieved October 25, 2007. National Park Service. Valley Forge. This page was last modified on 14 January 2016, at 21:23.